Nature finds a way - but often it's a heart that takes the lead. In the early hours of Sunday morning, Dan Oostenbrink was awoken by the sound of squawking outside his home in Chilliwack, Canada, where his family keeps a small flock of chickens as pets. He knew immediately that something was wrong, and quickly ran outside to see what had happened. "I saw a big eagle taking off in front of me, carrying away our hen," Dan told The Dodo. "It was sad because we are all quite attached to that bird." But the Oostenbrinks weren't the only ones attached to the hen. She and their rooster had recently hatched six fluffy chicks who, in an instant, were without the care and affection of their doting mother who'd died protecting them. All they could do now was huddle with one another for warmth. Unsure of what to do next, the Oostenbrinks decided to wait and see if the baby chickens would be able to fend for themselves - but by the next day, something incredible had happened. In search of the guidance their mother had offered them, the chicks began following around the family's rooster who, up until then, they had shown no interest in. And the feeling had been mutual. But that night something changed. 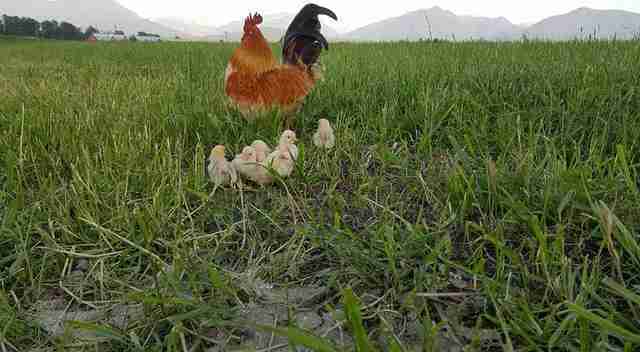 "My son runs in and says, 'Dad, the chicks are all under the rooster now! We were all absolutely amazed by that," Dan said. "He was puffing himself out and holding them under his wings." 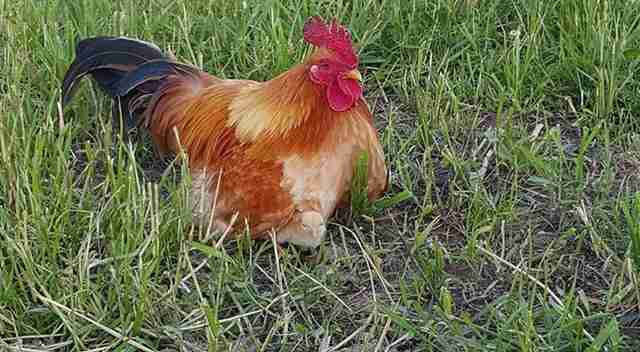 Roosters naturally play a hands-off role as parents, rarely interacting with their offspring directly, but upon seeing the helpless babies so desperate for their mom, the Oostenbrinks' rooster evidently decided to step into her role. "He suddenly got involved," said Dan. "He started finding bugs and dropping them in front of the chicks, feeding them. He leads them to water, protects them and shelters them. He's abandoned his normal roosting place to keep the chicks covered with his body at night. I've never seen a rooster behave like this before, like a hen. It's pretty amazing." Not only has the rooster embraced his new role of mom in action, he's adopted a motherly tone as well. "He's even started making these distinctive clucking noises, just like their mom had. They all come running around him." The Oostenbrinks aren't sure how to explain their rooster's uncanny shift in behavior, but that hasn't kept them from seeing the beauty in it. "I love observing nature, because when we see animals start behaving in a way we think only a human would, there's a lesson to be learned there," Dan said. "They have family, they care." "He's doing a great job being their mother. I mean, he's a little clumsy at it, like some dads might be, but he's doing his best. 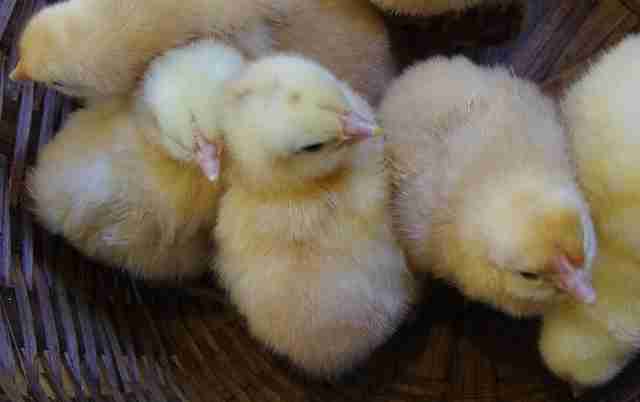 I think the chicks will all do great."